NEW YORK, July 19, 2018 — The nervous system is a complex organ that relies on a variety of biological players to ensure daily function of the human body. Myelin—a membrane produced by specialized glial cells—plays a critical role in protecting the fibers that help carry messages throughout the body. In the central nervous system (CNS), glial cells known as oligodendrocytes are responsible for producing myelin. Now, a paper published today in Nature Communications explains how researchers at the Advanced Science Research Center (ASRC) at The Graduate Center of The City University of New York have uncovered the role of a protein known as “PRMT5” in the production of myelin and, ultimately, proper development and function of the CNS. From infancy through adolescence, myelinating oligodendrocytes are generated in abundance in the human brain by progenitor cells in a process that is highly sensitive to hormones, nutrients and environmental conditions. In the adult brain, these progenitors cells—which similar to stem cells have the ability to differentiate into adult cells that perform specific tasks—serve as a reservoir for the generation of new myelin in response to learning and social experiences or to repair myelin loss after injury (e.g. after stroke or immune attack to myelin, as in Multiple Sclerosis). The molecular mechanisms that generate myelin-forming oligodendrocytes are only partially understood, but through their research, ASRC scientists are one step closer to identifying them. Their work has pinpointed PRMT5 as a protein that regulates the molecules responsible for stopping or promoting the expression of certain genes that are needed for survival of oligodendrocytes and production of myelin. In other words, PRMT5 essentially acts as a traffic cop, allowing progenitor cells to become oligodendrocytes and stopping the biological signals that would interfere with myelin production. “We were able to show that when PRMT5 is present, the progenitor cells are able to differentiate and become myelin-producing cells,” said Patrizia Casaccia, director of the ASRC’s Neuroscience Initiative and the Einstein Professor of Biology at Hunter College and at The Graduate Center, CUNY. “We discovered that progenitor cells lacking PRMT5 function essentially commit suicide while they are in the process of transitioning into myelin-forming cells. This discovery is important from a developmental and a translational standpoint. On one end, our findings allow a better understanding of how myelin is formed and possibly repaired when damaged. On the other end, they warn about potentially the possibility that pharmacological inhibitors of PRMT5, currently evaluated for their toxic function on glial tumor cells, might also kill healthy cells and prevent new myelin formation. ASRC researchers used three methods to eliminate PRMT5 and determine its role in myelin production in laboratory mice. First, they used CRISPR genetic ablation to target and eliminate the gene that produces PRMT5. In the second cohort, they used a pharmacological inhibitor to block activity of the protein. In the final cohort, they studied a group of knock-out mice who were born without the PRMT5-producing gene. In each case, removing or blocking PRMT5 resulted in reduced progenitor cell differentiation and death of the cells that were attempting to become myelin producers. The discovery of this correction was based on previous findings from the Casaccia’s laboratory about signals that interfere with myelin generation. These signals are carried out by enzymes called KATs (lysine acetyltransferases). The lab had previously shown that when KATs attach to nuclear proteins called histone, myelin formation is blocked. 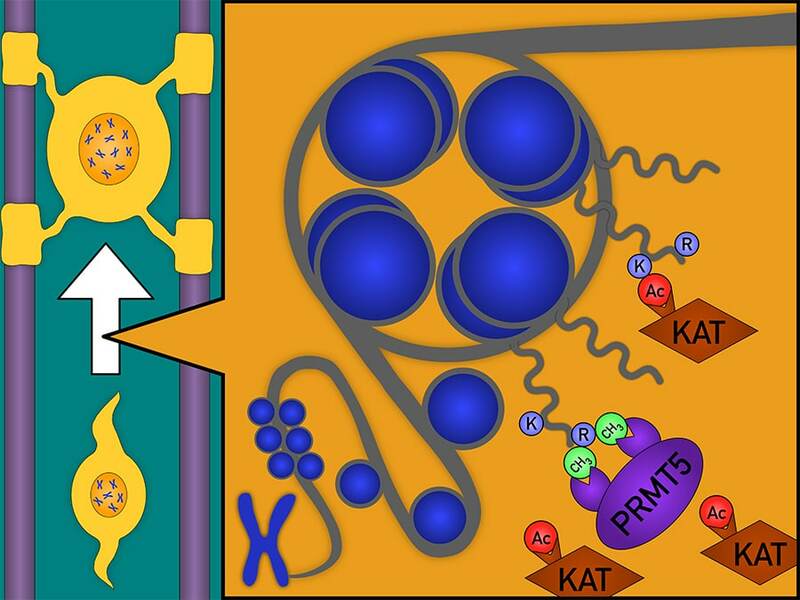 The researchers’ new work shows that blocking KATs can favor myelin formation and also overcome the effect of PRMT5 inhibitors. These findings could be critical to improving the survival of patients with malignancies that need to be treated with PRMT5 inhibitors. The ASRC’s neuroscience research team is now focused on determining how they can create favorable conditions for myelin-forming oligodendrocytes for the purpose of promoting healthy cognitive and behavioral development and identifying novel regenerative strategies for the injured brain. Our correct name is the Advance Science Research Center at the Graduate Center of the City University of New York. For the purpose of space, Advance Science Research Center, GC/CUNY is acceptable. On second reference, ASRC is correct. The ASRC at the Graduate Center elevates scientific research and education at CUNY and beyond through initiatives in five distinctive, but increasingly interconnected disciplines: environmental sciences, nanoscience, neuroscience, photonics, and structural biology. The ASRC promotes a collaborative, interdisciplinary research culture with renowned researchers from each of the initiatives working side-by-side in the ASRC’s core facilities, sharing equipment that is among the most advanced available. The Graduate Center of The City University of New York (CUNY) is a leader in public graduate education devoted to enhancing the public good through pioneering research, serious learning, and reasoned debate. The Graduate Center offers ambitious students more than 40 doctoral and master’s programs of the highest caliber, taught by top faculty from throughout CUNY — the world’s largest public urban university. Through its nearly 40 centers, institutes, and initiatives, including its Advanced Science Research Center (ASRC), The Graduate Center influences public policy and discourse and shapes innovation. The Graduate Center’s extensive public programs make it a home for culture and conversation.